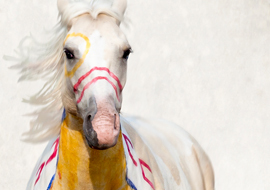 After a Long Absence-The Horse Returns | A Song for the Horse Nation - October 29, 2011 through January 7, 2013 - The National Museum of the American Indian - Washington, D.C. The horse originated in the Americas more than 40 million years ago. After spreading to Asia and Europe, it became extinct in its homeland. In 1493, the horse returned to the Western Hemisphere when Columbus brought a herd of 25 on his second voyage. 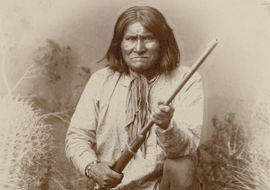 Back in the Americas, its native environment, the horse flourished. 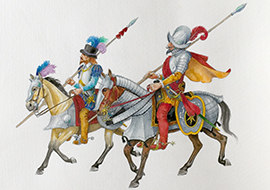 The Spanish used the horse as an instrument of warfare and control. 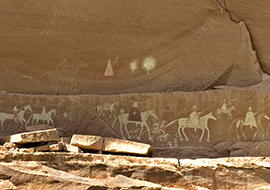 But as soon as horses came into Indian hands, Native peoples began to weave a close relationship with the Horse Nation. 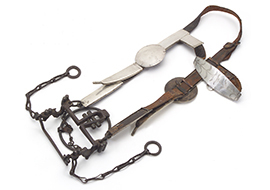 By the late 1700s, virtually every tribe in the West was mounted. 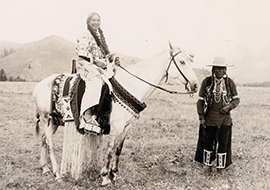 Horses strengthened Native communities and helped in the fight for Indian lands.